As Catholics and as citizens, it can be easy to fall into a state of complacency. With a round-the-clock news cycle pushing competing and sensationalist headlines into our consciousness via every television, digital device and newspaper in sight, delving deeply into the issues of public policy that matter to us as Catholics is difficult. Events like Catholics at the Capitol — a day of prayer, formation and advocacy Tuesday, April 30, at the Monona Terrace Community and Convention Center in Madison — are the proverbial silver bullet to that civic torpor. Traditionally held in the spring of odd-numbered years, Catholics at the Capitol — sponsored in part by the Wisconsin Catholic Conference (WCC), which serves as the public policy voice of Wisconsin’s bishops — is an opportunity to inform and invigorate the faithful in their role as citizens and as people of faith, explained WCC executive director Kim Vercauteren. “It’s going to be a fun day — we’re already encouraged by the turnout, and we’ve got a lot of young people coming,” said Vercauteren. Beginning with registration and breakfast at 8:30 a.m., the day will feature a keynote address by Milwaukee’s own Vincent Noth and Samantha Vosters, breakout sessions addressing various pastoral and policy issues, legislative reviews and visits and, for the first time ever, a presentation and prayer service in the rotunda at the Wisconsin State Capitol in celebration of WCC’s 50th anniversary. Noth has been the executive director of the Riverwest Food Pantry since 2013, and Vosters has been its director of team formation since 2014; she also helped to found the Riverwest Food Pantry’s Mission Internship program, where men and women of faith spend a year serving the organization and the wider community. Breakout sessions will include Solutions to Homelessness, where two Catholic Charities models (one serving an urban population and one serving a more rural population) will be explored; Latino Ministry and Services, where pastoral leaders will discuss the needs and gifts of the Latino community and how churches can be more welcoming to them; Innovations in Pro-Life Health Care, which will examine two models of Catholic healthcare in the state of Wisconsin that serve its most vulnerable communities; Prison Ministry and Re-Entry, where two Milwaukee natives — Rev. Msgr. James Bartylla (current diocesan administrator for the Diocese of Madison following the death of Bishop Robert Morlino) and 2018 Vatican II Award recipient Michael Adams — will discuss the challenges faced by offenders both while they are incarcerated and after they rejoin society; and finally, Introduction to Catholic Social Teaching, led by Professor Tom Thibodeau from Viterbo University. Following the breakout sessions and prayer service at the rotunda, attendees are encouraged to visit with their legislators at the Capitol until approximately 2 p.m. The bus will start in downtown Milwaukee and stop at various Park and Rides along I-94 to Madison. Registration is $20 and can be completed online. Email ShelledyR@archmil.org for more information. Bus registration must be completed separately from the event registration, which is due April 22, and can be completed online at wisconsincatholic.org. Advance registration fees are $40 per person and $12 per student. Those who need scholarship assistance are encouraged to contact the event organizers. Vercauteren said that they are also working to make the event family-friendly, and will have a nursing room as well as a room designated for children. Founded in 1969 by the bishops of Wisconsin, the WCC provides a Catholic lens for matters of legislation and public policy both at the state and national level. 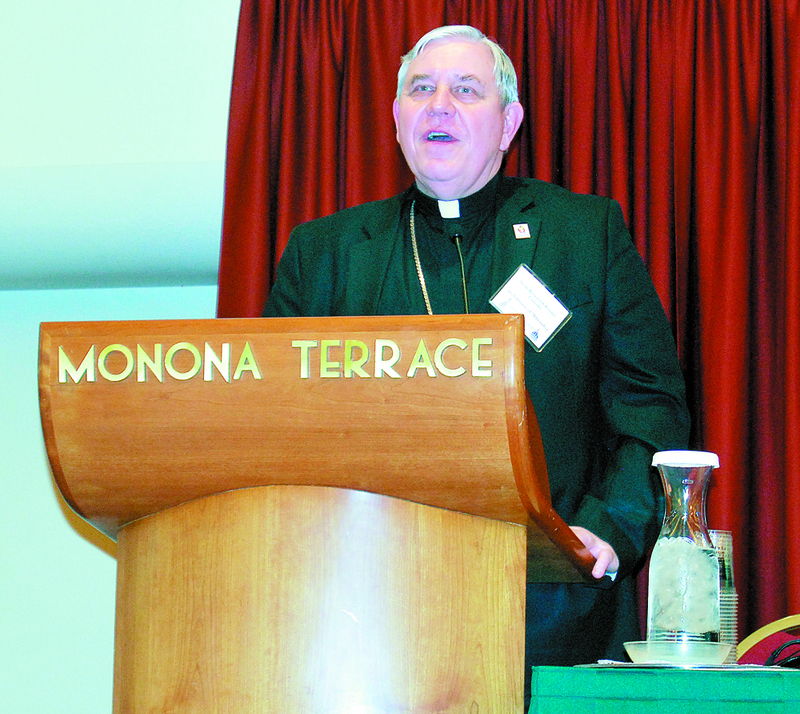 All Wisconsin bishops, retired and current, who choose to be active in the organization are on the board of directors, of which Archbishop Jerome E. Listecki is president. The WCC’s website is a wealth of resources for Catholic citizens wishing to remain up-to-date on issues of concern to the Church, from the savviest political news junkie to the public policy novice. There’s a legislative manual, legislative directory, issue briefs, bishops’ statements and much more, including a Capitol Report newsletter that can be received electronically or by traditional mail.